Japan has not changed its assessment of the threat posed by nuclear-armed North Korea despite the June 12 U.S.-North Korea summit and ensuing denuclearization talks between the two countries, the Defense Ministry stated in its annual white paper released Tuesday. Pyongyang has already deployed “several hundred” Rodong ballistic missiles, whose range covers almost all of Japan’s territory, and Pyongyang may have already succeeded in producing nuclear warheads small enough to fit on those missiles, the ministry warned. The June 12 meeting between North Korean leader Kim Jong Un and U.S. President Donald Trump had “major significance”, the paper noted, because Kim reconfirmed his pledge to make efforts toward denuclearization of the Korean Peninsula in a written statement. But “we need to carefully ascertain what specific actions North Korea will take toward abolition of nuclear weapons and (ballistic) missiles from now,” the 564-page annual defense paper stressed. The analysis section of this year’s white paper reflects the deep skepticism held by Japanese diplomats and defense officials over the ongoing denuclearization talks between Pyongyang and Washington. On April 27, Kim and South Korean President Moon Jae-in met in Panmunjom on the border of the two countries and pledged to work for the “complete denuclearization of the Korean Peninsula.” The Kim-Trump meeting of June 12 in Singapore reconfirmed the pledge. But since then, “there has not been much progress” in talks to denuclearize North Korea, a key senior Japanese diplomat in Tokyo said last week. “In reality, things are not making progress,” the official said, speaking on condition of anonymity. 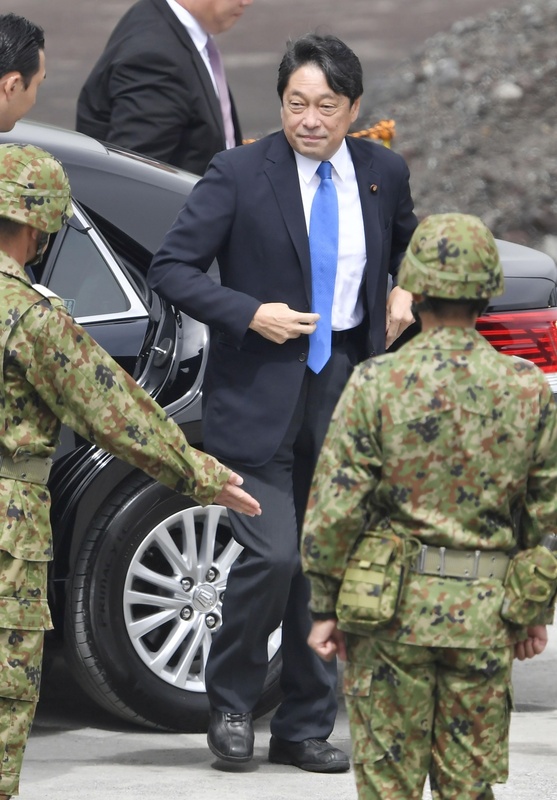 Japan is fully cooperating with Washington’s diplomatic efforts to denuclearize the hermit state, the U.S. being Japan’s sole military ally, placing the endeavor at the center of diplomatic moves by Prime Minister Shinzo Abe’s administration. 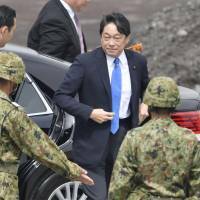 But Pyongyang has yet to take any concrete steps to dismantle any of its ballistic missiles or nuclear weapons, deepening skepticism among Japan-based officials and experts. The analysis section of the white paper mainly discusses the potential military threats posed by three countries: North Korea, China and Russia. China has been expanding its defense budget for more than 25 years, and is rapidly strengthening its military capability — in particular its nuclear weapons, missiles, air force and naval power, the white paper said. Beijing has also continued military and coast guard operations around the Senkaku Islands in the East China Sea. The Japan-controlled islets are claimed by Beijing and known as Diaoyu in China. As a result, a so-called “gray zone” situation — one that is neither wartime emergency nor normal peacetime — has continued for a long time and will be extended further, the ministry predicted. As for Russia, the paper pointed out that Moscow has recently strengthened its military activities and deployment in the Russia-controlled, disputed four islands off Hokkaido known as the Northern Territories in Japan and the Southern Kurils in Russia. Such activities include the deployment of surface-to-ship missiles and a plan to station a new division of ground troops in the area, the paper pointed out. “We need to keep carefully watching the activities of Russian forces in the Far East, including the Northern Territories,” the white paper says.